So here’s the scoop. In December of 2011 I decided to do something about my health. I weighed 465 lbs, I had no energy, I couldn’t walk up a single flight of stairs without getting winded… and I was sick of it. I’ve lost and gained weight throughout my life. I went on a diet in my early 20’s after seeing some awful pics of myself from vacation. My lightest adult weight was 240 lbs, and at 6’3″ that really wasn’t too bad. However over the years the weight slowly returned, and this time it brought some of its friends. I started this blog mainly for myself. To hold me accountable, to share things that work and don’t work for me, to see my progress so I stay encouraged. And who knows, maybe someone will even find something useful or encouraging on here. I’ll share weight loss posts, my hiking journal, pictures, recipes and other stuff from time to time. As of July 1, 2012 (the day I started this blog) I have lost 47.2 lbs. (It’s Oct. 3 now and I’m down 74 lbs!) One thing people ask me when they notice I’m dropping weight is, “How are you doing it?” The truth is I totally revamped my lifestyle. Eating less, eating healthier and being more active. I don’t have a secret or a trick, no pills (other than vitamins), no surgery… just a simple healthy diet and exercise. I don’t call what I’m doing a “diet”, because it isn’t. People go on diets to lose weight, they lose the weight and go off the diet and then gain it back – that’s not what I’m looking for. I want to lose the weight, keep it off and enjoy a better quality of life. The only way to do that was to totally remodel my lifestyle. I apply the 80/20 rule (probably more of 90/10 most times) in that I do everything I’m supposed to at least 80% of the time, then when I want some wings and beers with the guys or a piece of pepperoni pizza I don’t have to feel guilty about it. However I do count those calories and adjust for it by eating lighter at other meals or getting in a bit more exercise. Nothing is off limits for me but I do choose not to eat some things simply because the calories are not worth it to me. A bakery near me has these amazing custard-filled, chocolate-iced eclairs – but I can’t eat a 500 calorie eclair knowing that’s 1/4 of my daily calories, it’s just not worth and I an find a much healthier option that will take care of that sweet tooth for me. Thanks for taking the time to read about me and my goals. If you have any questions or comments please feel free to let me know… and wish me luck! * I use myfitnesspal.com and fitocracy.com (username itsme_timd) to help keep me on track. Please feel free to follow/friend me on either site. Congrats Tim for taking initiative on your personal goals! 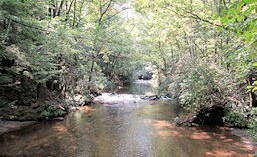 I just checked out your Echota SP post – nice pictures! I liked how you set up the gallery slideshow at the bottom. The note about the Cherokee Deportation / Trail of Tears was significant for me as I have recently been reconnecting with my family on the Native American genealogical front. Anyways, here’s wishing you luck on your venture into a more healthy lifestyle! You got a Follow from me, my friend! Thanks! Glad you enjoyed the post. I’m fortunate the have a lot of great hikes close by with a lot of history attached, plenty to keep me busy. I like your blog as well and am now following you as well. Just found this blog, looking forward to following along. Thanks! Hope you enjoy the posts!